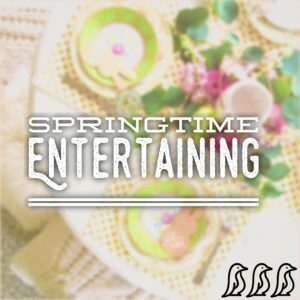 Spring is such a lovely time for hosting a party, don’t you think? Everyone is ready to slip on their sandals and leave behind their hibernating ways! So whether it’s a special occasion like Easter or no occasion at all, gathering around a pretty table with friends is always a good idea! I believe there can be so much joy found hosting in your home. 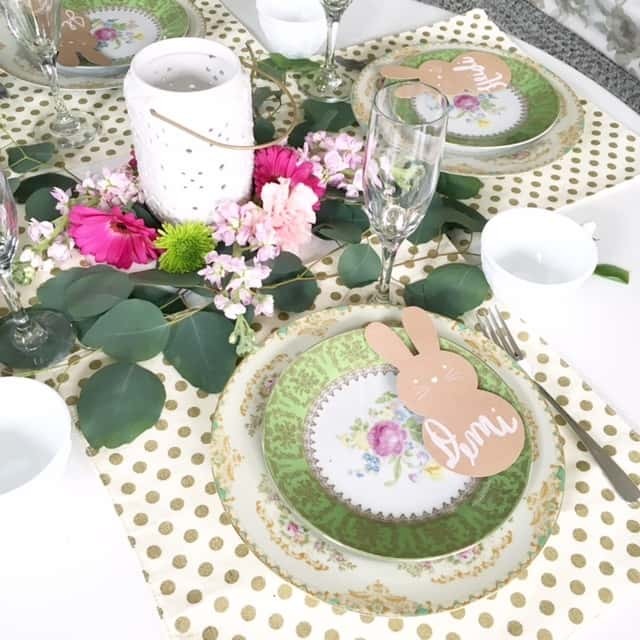 But all too often it ends up being stressful because we are worried about the space not being “right” or the lack of budget for a “Pinterest perfect” party. First and foremost, remember that a gathering is really all about the people around your table. 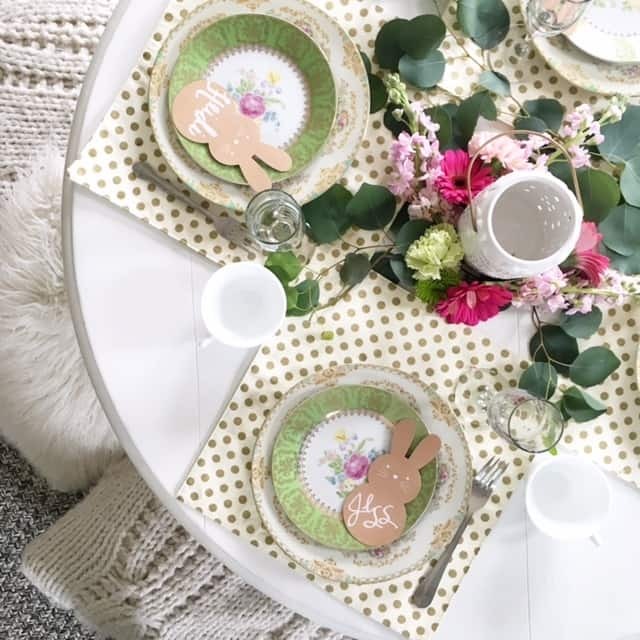 But creating a special ambiance can say, “I care about you and our time together.” Hopefully these simple, budget friendly tips can help you in hosting a special brunch for your friends & family. 1. Think outside the box as far as where to sit. It doesn’t have to be around a typical dining room table. 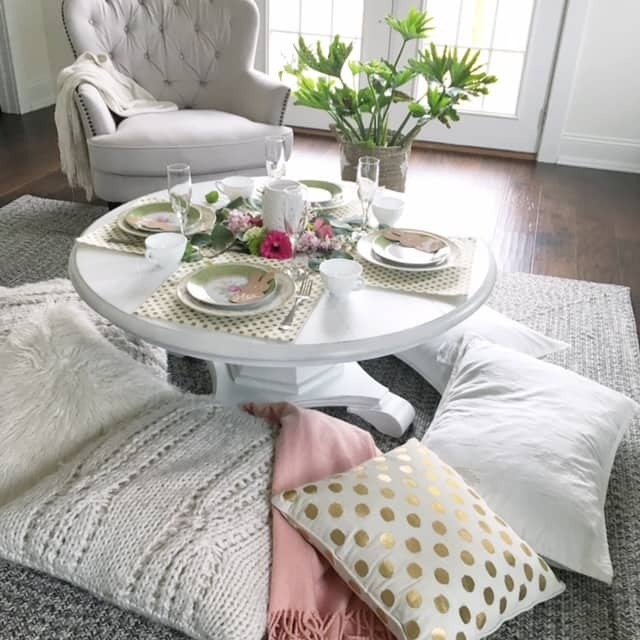 While a dining space could be the perfect place for your brunch, you could also gather around a kitchen island, take the party outside, or even gather around a coffee table if you have a smaller party like I’m highlighting in the picture. 2. Shop at Thrift stores for pretty dishes…or don’t use dishes at all! There are so many lovely paper options, which make for an easy clean up as well so you have more time for just being together. 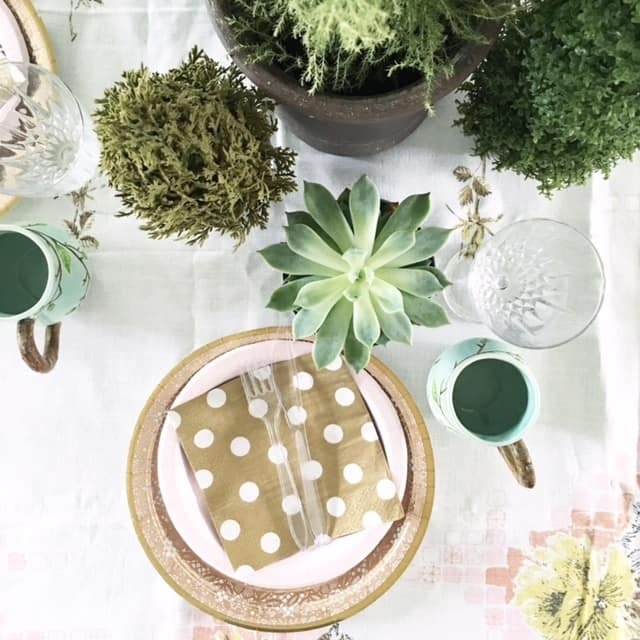 At this table setting I used dishes I found at Goodwill. I paid $2.97 for each large plate and $.97 for the smaller ones! These were perfect for spring, with the bright florals and gold detailing. In this example, I used all paper products. I stacked 2 different sized paper plates to add interest! Paper products can be great especially if you’re hosting a larger party and want everyone’s place setting to still match. 3. Centerpieces can be a beautiful focal for your table, but doesn’t need to cost a lot. In both of these example I kept cost low by gathering items from around my home or purchasing a few items from the dollar bins at Target! Silver Dollar eucalyptus dresses up a table beautifully and fills in arrangements or tables so well. You can find it at Costco, our local downtown Central Market and some grocery stores. As far as flowers think grocery store flowers! They are easily accessible and so affordable. On this table I used silver dollar, cut the tips off a mixed bouquet from the grocery store and placed a small ceramic lantern from Target dollar bins in the middle. I also made name cards from cardstock bunnies I found in the dollar bins as well! 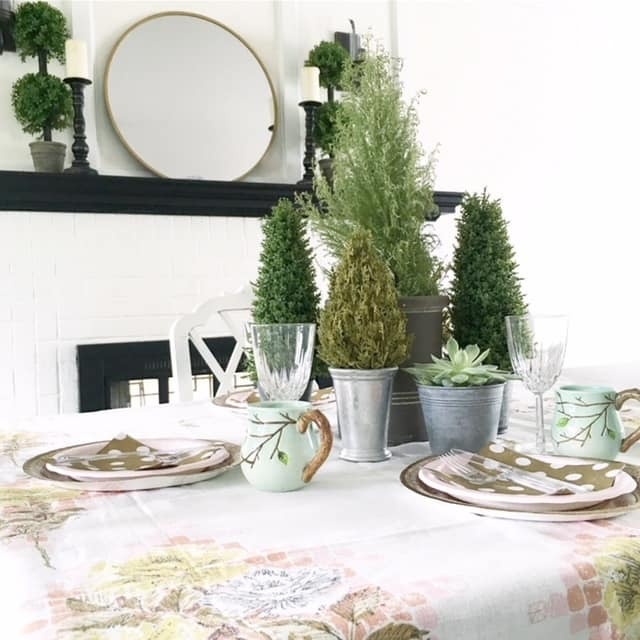 For this centerpiece I gathered potted green trees & succulents I already had around my house. Take a look around and see what you might be able to pull from other places in your home! 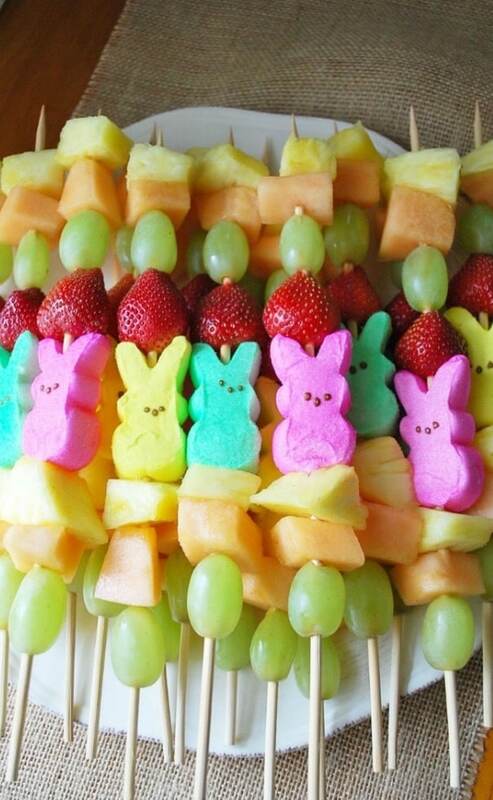 Group them together to make a statement centerpiece. In this example, a small succulent could be placed at each person spot with a name tag and then could be taken home as a small gift. 4. As far as your menu keep it SIMPLE. I like to make things that can be prepared ahead of time, which is especially easy to do with breakfast/brunch type foods. I’ve shared some examples of recipes that I’ve tried and were successful, which tells you they had to be easy! I found all of these on Pinterest and have included the sources for these recipes so you can find other great dishes on these websites. In medium bowl, mix Bisquick mix and milk with wooden spoon to form thick dough. Dump out onto floured surface, and use a floured rolling-pin to roll it 1/4 inch thick. Cut into rounds with 3- or 4-inch round cutter. Press the rounds into muffin cups. Sprinkle cheese in each cup, followed by a few cubes of ham. Crack the eggs individually into small bowl, then gently slide 1 egg into each muffin cup. Top with remaining cheese and ham. Sprinkle with salt, pepper and rosemary. Bake 20 to 25 minutes or until egg whites are set. Cool in pan 5 minutes, then lift cups out using knife. Serve immediately. 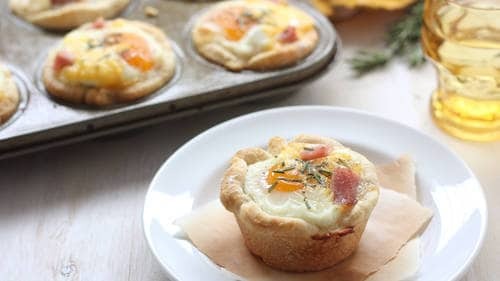 Store leftover egg cups in an airtight container in the fridge up to 3 days or in the freezer up to 1 week. Reheat in the microwave. Add in the greek yogurt, honey, vanilla extract and egg, mixing by hand with a spatula. Add the chocolate chips, mix. Spray a loaf pan with non-stick cooking spray. Pour the batter into the pan. 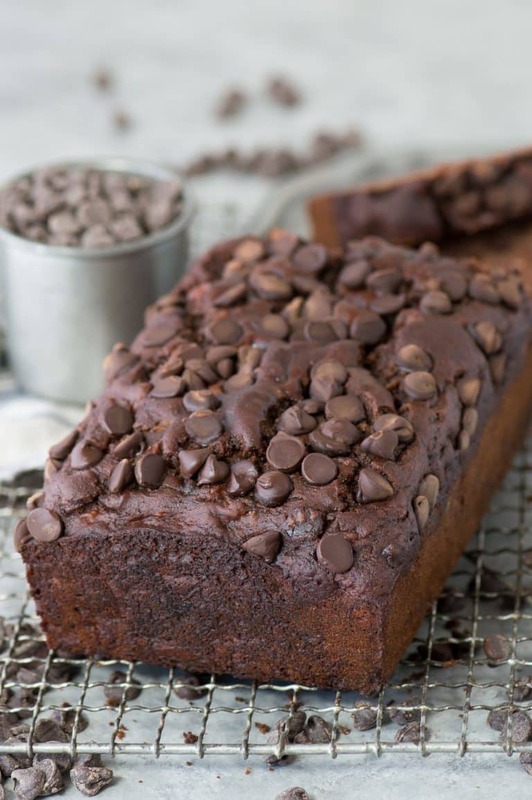 Add additional chocolate chips to the top if desired. Bake for 47-50 minutes or until toothpick inserted in the center comes out clean. So put a date on the calendar, call a few friends, and bring in Spring with a fling! 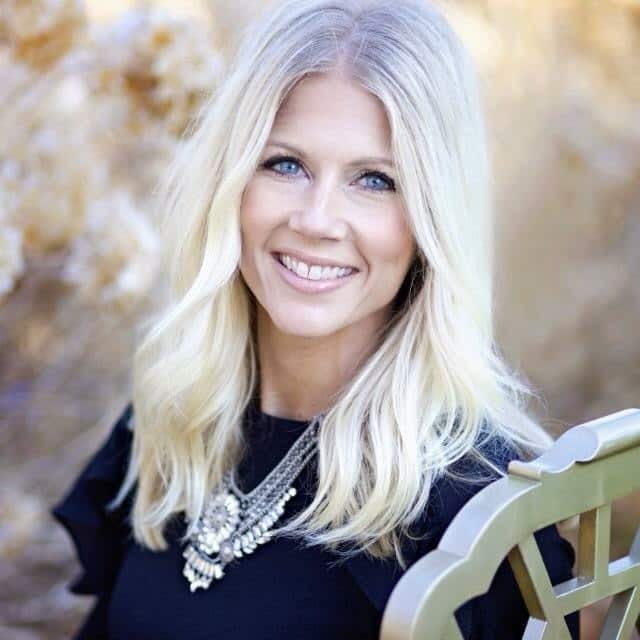 Carey Bender is a wife, mom, and entrepreneur. She is a fashion lover and a fitness fanatic who is always looking for a DIY project, a perfect cup of coffee, and inspiration around every corner. Carey adores Lancaster County living, but is always dreaming up her next adventure.